Are you all ready for your Hocking Hills vacation? Or are you still in the planning stages? Whether you’re the type that has your checklist complete and bags packed or an adventure seeker in search of a last minute getaway, we’ve got just what you need to put the final touches on your Hocking Hills itinerary! Here are some local events happening this next week! Enjoy an educational guided hike, led by local naturalist highlighting the Ohio State Wildflower, the Great White Trillium! There will be morning and afternoon hikes, and a “pot luck” meal, so bring along a dish or dessert to share! For additional information head over to the Appalachian Ohio Association webpage! If you’re interested in a more private hike, make sure to check out our 5+ Miles of Groomed Hiking Trails on property! Only accessible to Cherry Ridge Retreat registered guests, you are guaranteed a great hike without the crowds, plus we have trail heads coming from each cabin! Trails right out the front door, something you will only find at your Cherry Ridge Retreat cabin! Enjoy some live music while sampling Brewery 33’s collection of craft beers, wines, ciders and meads. Samplers available! Music from 4-7pm. And if you’re looking for a more intimate setting for music and drinks, don’t forget that you can always add a bottle of champagne to your reservation and tune into our Sirius XM stations in your Cherry Ridge Retreat cabin! Check out our Upgrades page or give us a call at 740-380-7777 to add some to your stay today! Observe the night sky! The moon will be full and bright on Friday, but if you can’t make that viewing stop on over on Saturday! Watch the moon rise with John Glenn’s incredible telescopes! Reserve your spot today! And if you like top notch sky views, consider booking a stay at Cherry Ridge Retreat’s Observatory cabin. Situated at the top of a lush hill, The Observatory offers the perfect views of the surrounding area as well as being perfect for sky gazing. And did I mention the Celestron Astromaster EQ Telescope included in the cabin? When you factor in the Hot Springs Hot Tub perfectly situated to take advantage of the views, the in-ground cold plunge water feature and seasonal in-ground heated swimming pool, it’s easy to see why The Observatory is one of our most popular cabins! Fly Fishing Demonstration. Hot Dogs, Chips and snacks provided! 9am-2:30pm, meeting at Lake Rose. Enjoy the gorgeous views of Ash Cave while learning about the unique history of the the area and of Ash Cave itself! Cave exploration by lantern light, how exciting! Meeting at Ash Cave at 8pm. 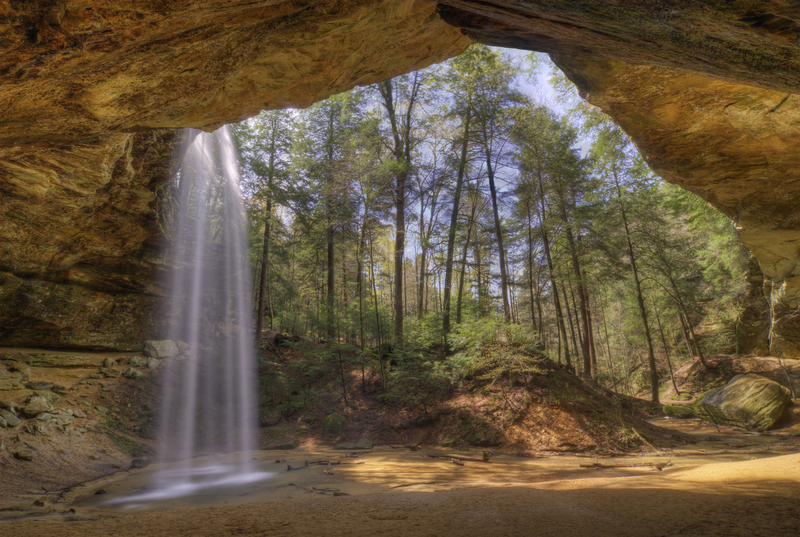 Come out and observe the beauty of Hocking Hills, from the tiny wildflower, to the massive waterfalls! Meet at the parking lot of Ash Cave at 10am. Ash Cave is only about a 15 minute drive from your Cherry Ridge Retreat cabin! To get an idea of the distance from your cabin from some Hocking Hills attractions make sure you check out our area map! And don’t forget to look into the many hiking trails by Ash Cave! Explore the nice 1/2 mile hike around the rim of the cave, or if you’re feeling extra adventurous, enjoy the 3 mile trail from Ash Cave to Cedar Falls -but don’t forget you’ll have to hike back as well! Athens Farmer’s Market is a great place to stop by for local produce, maple syrup, baked goods, salsa, crafts and so much more! You never know what you’ll find at the Athens Farmers Market, but you know it will be local, fresh and handmade. From 9am-12pm, at 1000 East State Street in Athens. And if local treats are what you’re interested in, you have got to add some of Wren Valley Truffles’ or treats to your reservation. For more info, look at our Upgrades page! We offer Wren Valley’s signature Truffles in 4 or 8 pack gift boxes, as well as their Smoked Salt and Espresso Chocolate Covered Caramels. If you are looking to experience a taste of the Hocking Hills, Wren Valley is what you’re looking for. Add a pack to your stay today, you won’t regret it! That’s this week in Hocking Hills! We hope that this list provides you with some ideas for how to pass your time once you’ve made it to the region! Although to be honest, we’ve had many of our guests report that they never left property once they arrived. That’s the great thing about planning your Hocking Hills getaway, whether you plan to lounge in your private hot tub all day or get out and explore the local State Parks, we’re sure it will be an experience you won’t forget! We hope you enjoy your visit to the beautiful Hocking Hills!